Alex's recent catch! 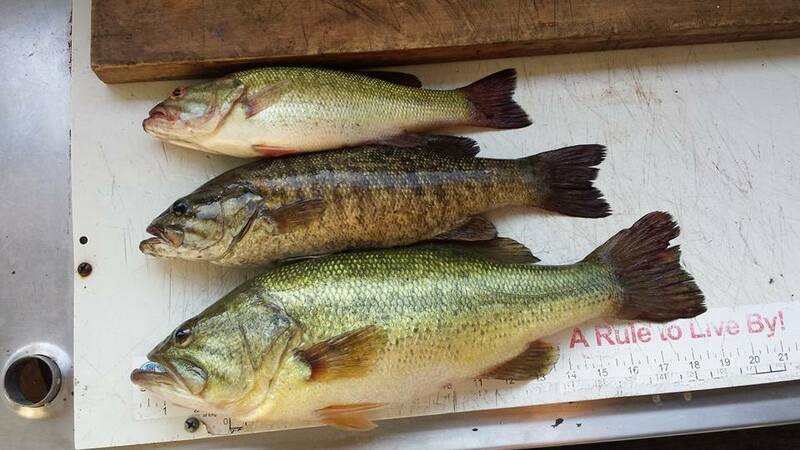 13" kentucky, 15" small mouth, and a 18 1/2" large mouth. All the black bass! 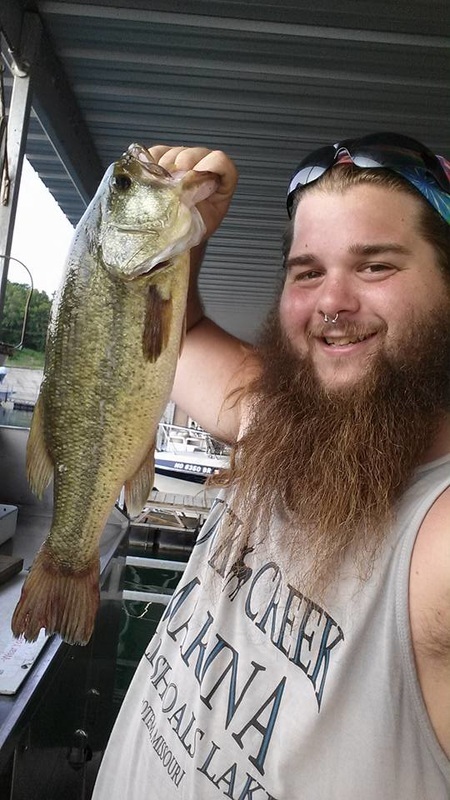 The absence of fishing reports has been largely due to my absence from being on the lake, but with the help of those who have the time to test the waters, I’m able to give some information current to the times. The summer is upon us in blazing intensity and has raised the lake’s surface temps to the mid to lower 80’s. The divers have reported the thermocline to begin about 17 feet down with an increasing coolness until they reach about 20 feet after which the water temp is constant at about 55 degrees. The clarity above the thermocline varies with the location around the lake with the deeper waters along the bluffs generally being clearer than along the more gradual slopping banks. The results of these facts become evident when fishing with deep diving crank baits or pig’n’jig type lures along the chunk rock banks where the incline is running near 35 degrees or more. Some of the better fishermen have been bouncing deep cranks along the bottom while sitting in water more than 40 feet deep and finding better than average Small Mouth Bass hitting about the time the lure stops hitting the bottom and dives free of the rocks. Similar hits have occurred on the jig baits when the lures reach the top of the thermocline. Since summer Walleye tend to run in the upper level of the thermocline, there have been some 4 to 7 pound trophies taken in that zone. If sleep is secondary and early morning top water is your goal, then be out there at least a half hour to an hour before sunrise is forecast and position yourself at the primary points of the major coves or feeder arms and wait! You’ll likely hear them before yo see them as the bass begin chasing the bait fish to the surface. This pattern can last from a quarter to a full hour depending on your luck but when all surface action has stopped, have a spoon ready to cast into the areas where the greatest activity occurred. Let the spoon fall for 6 to 8 seconds on a ¾ ounce spoon and it will drop to the lower part of the thermocline. If a fish hasn’t hit it on the fall, retrieve it in short jerks back to you and repeat. Many of the best fish will be beneath the smaller fish that were at the surface and surprises await the patient angler. Good luck and let me know how you do. Ed Cerar and Shannon Loveall have been helpful as well as making me envious. The water is starting to clear with the lake level near normal pool and the water temperature has been hovering in the low to mid 50's. The bass fishing has been very good with many caught on Alabama rigs, using jerk baits (Rogue), and crankbaits (Wiggle Warts). White bass are being caught in the larger creeks on spinner baits (Bangtail) and swimming minnows. Some crappie are being caught off of the brush piles in about 25 feet of water with live minnows working the best. Around the dock, Alex said he has started seeing bluegill swimming about. We have seen a lot of the seagulls swirling and crashing into the water chasing the shad. As the water temps continue to rise, the fish should be spawning soon. We are having a great start to the spring fishing season! The water level has been falling fast and the lake is only about 5ft above normal pool. We have a parking lot at the dock again and have removed most of the extended walkway. This Saturday, the Joe Bass Team Trail Tournament will begin at 7am with the weigh-in to be at 3p. It's so exciting to see them all head out at sunrise full of hope and determination. Good luck to all of the participants! We're looking forward to the warmer temps this week and plan to get a bit more of the off-season maintenance finished at the boat dock. © 2018 Buck Creek Marina. All Rights Reserved.